Dr. Ernest Drake was born in 1822 in St. Leonard’s Forest in Sussex, England. As a boy he was fascinated by paleontology, thanks to the fossil mania that had been sparked by Gideon Mantell’s discovery of the iguanodon tooth near Cuckfield in Sussex the year Ernest was born. When he was eight years old he had his first encounter with the knucker named Weasel, thinking it must be some kind of dinosaur. Nobody believed his story until he met then Dragon Master Ebenezer Crook at a meeting of the Sussex Archaological Society when he was fourteen years old. After he graduated from university in 1843, Drake studied dragonology under Ebenezer Crook, becoming a Dragonologist First Class in 1852, which enabled him to assume the title of “Doctor of Dragonology” after completing a groundbreaking scientific work on the migratory habits of Frost Dragons. 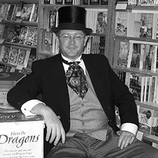 He then set up a shop in the Seven Dials in London called Dr. Drake’s Dragonalia as a modern front for the much older Secret and Ancient Society of Dragonologists. There he taught dragonology to a few select pupils. His magnum opus was a book called Dragonology, which was initially published on a print run of only one hundred copies in 1896, but he also produced several other works related to dragons. All of these books stress the recurring themes that dragons ought to become objects of scientific study and that, as they are scarce, it is the responsibility of dragonologists to conserve and protect them wherever they may be found.